When I find myself depleted spiritually or emotionally, there’s a place to refill the tank…the Word. God’s word is spiritual nourishment. It is much needed fuel for the day and satisfies completely. His word restores and energizes. It comforts and encourages. It’s packed full of health food for the soul—like peace, wisdom and strength. The Word keeps me alive spiritually. When I’m feeling down, it restores joy. The Word brings light into dark and hope into disappointments. It settles me when I’m anxious and calms me when I am afraid. Thank you for your Word, Lord. It satisfies like nothing else. I grew up on a Kentucky farm with six brothers and sisters. Our favorite pastime was swimming in the creek. Many Sunday afternoons were spent in those cool rippling waters. Our attention could not have been more fully in the moment as we waded, floated and swam between those tree-lined banks. We delighted in that creek. To delight in the Lord is to be fully engaged in him. If I delight in him, my desires will be for the blessings of God and those desires will be met. I won’t have to overthink my life satisfaction rating. If I’m immersed in him my desires will be intune with his wishes and satisfied. Lord, give me a desire to fully delight in you—to know you more and follow you closer. I’d like to be as delighted in you as a bunch of country kids in the creek on Sunday afternoon. Knowing Christ adds a whole new dimension to life. As the beauty of his truths grow in clarity, old thought patterns and beliefs fade away. There’s a new song rising in hearts open to Him. This new song sounds different. It speaks of love that conquers and peace beyond all understanding, of no condemnation and comfort for the soul. It speaks of life filled to the brim and deep purpose—a higher calling for which to live. Let the new song ring loud and clear. Let the old song be drowned out by strands of joy and peace, of hope and love eternal. Let the old song of fear and regret be silenced. Forever. Lord, sometimes the old song threatens to take over. Let it be silenced. And as the new song swells may it drown out the old refrains. And may a song of praise ever rise to you. Dread hangs like a heavy dark cloud that may or may not release rain. It specializes in blocking out the sun. Living in dread of what could happen zaps spiritual strength and is a waste of mental energy. One day of dread added to another, and then another, can result in a lifetime of hovering dark clouds. I thought it was good to be prepared for the worst. How do I step out of this brooding, foreboding mindset and stop fearing bad news that could happen? Regardless of what happens or doesn’t happen, God will take care of me. If I need to make adjustments, He’ll let me know. If the bottom falls out, He’s got me. If relationships are strained, He’ll walk with me through the difficult situation. If I’m settled in my mind that God will take care of me, dread has no place to take hold. Now then, be settled. God’s got this. fears that race like thoroughbreds through my worry-prone head? where, tell me where, will worries then tread? I keep hitting speed bumps on this journey through The One Year Bible. They’re showing up all over the place. They slow me down; they cause me to pause. The speed bumps? Giving thanks. All through scripture there are reminders to give thanks to God—encouragements to take the time to express appreciation for his gifts. When I slow down—by force or by choice—life becomes less stressful. There’s peace. Thanksgiving changes me. It changes my outlook on the day, the year and the years all strung together—life. When I give thanks, I’m no longer focused on what I don’t have or what didn’t go my way, I can focus on what I do have and the good that will come. Giving thanks is the door to deep-rooted contentment. I don’t want to arrive at the end of the road grumpy and bitter, having missed out on joys along the way. 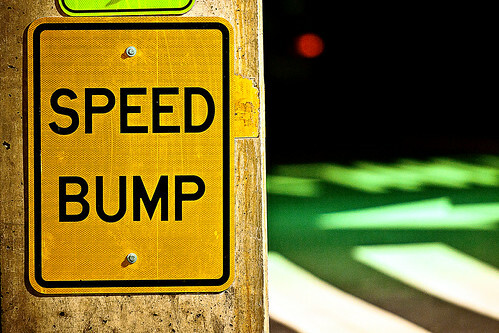 The speed bumps in God’s word will help me arrive with gratitude. And by the way, dear reader, I’m thankful for you! *The One Year Bible 10/7, NIV, copyright 1986, Tyndale House Publishers, Wheaton, Illinois.